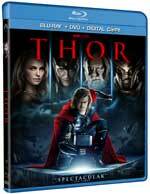 The god of thunder arrived in stores on Sept. 13, 2011. 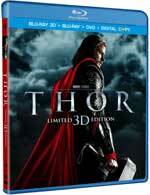 Thor was released on DVD and in Blu-ray and Blu-ray 3D combo packs from Paramount Home Entertainment. The latest movie based on a Marvel comic book character, Thor grossed $177.5 million in theaters in the U.S. and a whopping $440 million worldwide. Critics had mixed reviews for the film, generally saying that although it’s not brilliant, it’s entertaining enough to be worth seeing. 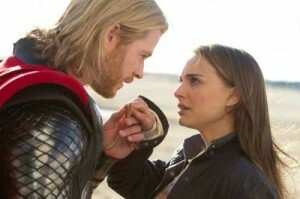 Thor stars Australian actor Chris Hemsworth (A Perfect Getaway) as the title superhero, who’s sent to Earth by his father (Anthony Hopkins, The Rite) as punishment for his arrogance. On our planet, Thor meets and falls for scientist Natalie Portman (Black Swan), who teaches him a thing or two. Meanwhile, Thor’s strength comes in handy when a villain from his homeland sends bad forces our way. The cast also stars Stellan Skarsgard (A Somewhat Gentle Man), Kat Dennings (Daydream Nation) and Idris Elba (The Losers). The PG-13 rated action fantasy movie is priced at $29.99 on DVD, $39.99 in a Blu-ray/DVD combo pack and $54.99 for the three-disc Blu-ray 3D/Blu-ray/DVD combo. The discs include 80 minutes of bonus material, including a special feature that looks at the Marvel Universe, a sneak peek at Marvel’s The Avengers and a look inside the world of director Kenneth Branagh (Hamlet).